Are you sick of wearing your scarves the same simple way you have been wearing them since middle school? Do you see women all around you with their scarves tied in such interesting ways and wondered how to make your own scarf look that good? If you answered "yes" to either of those questions this is the post for you! 1. Start with the scarf open around your neck. 2. Twist the ends, one over the other. Adjust the loop to be the size you want your final braided loop to be. 3. Twist one end over the other again. 4. Take the bottom end and pull it over and into the neck hole. 5. Fold it back over the other side. 6. Repeat with the other end. Twist the ends over each other and bring the end you are working with through the neck hole. 7. Repeat over and through, switch ends, over and through, switch ends. 8. Knot the end and either tuck the ends to hide them or leave them out. Adjust your braid so it hangs how you want it to. 1. 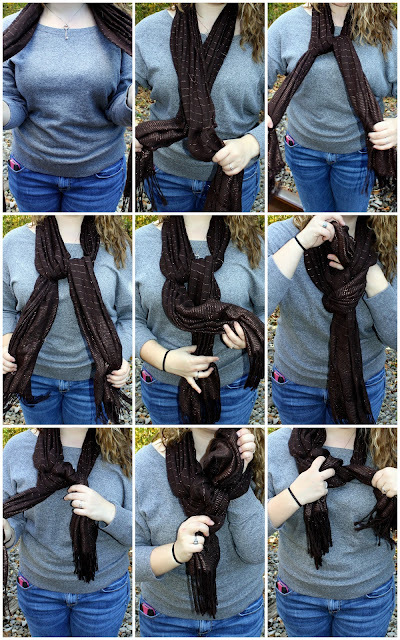 Fold the scarf in half and then wrap it around your neck. 2. Put your hand through the loop on the folded end and pull one of the loose ends through the hole. 3. Twist the loop on the folded end. 4. Pull the second loose end through the hole. 5. 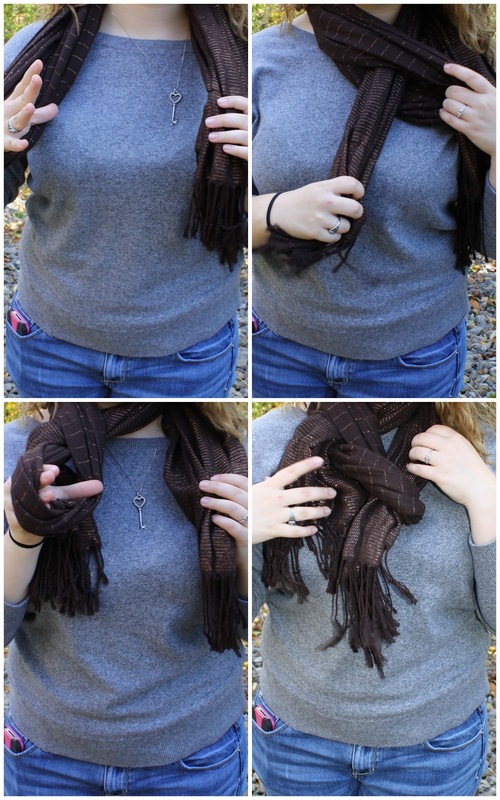 Fluff the scarf and rearrange the twists until it lays flat on your chest. 1. Tie the ends of your scarf into a knot. 2. Tie the ends of your scarf into a second knot, forming a double knot. 3. 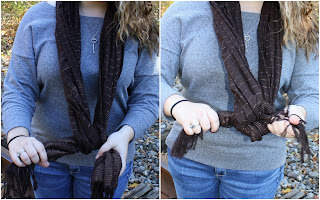 Rearrange your scarf so the knot is on the side, as shown above. Hi Amanda! Thanks for stopping today! I love this post- it's always fun to learn new ways to tie a scarf. :) And your blog is great- I have a list of 40 things, too! Keep going- challenging yourself to grow is an incredible adventure, right?! These are all really cute and totally different. Thanks for sharing! !